Saturday mornings were always an adventure at the mansion, especially since it was following the Thanksgiving holiday weekend and the kids hadn’t had to do any schooling for several days. Snow hit Scott’s window and he frowned, Ro said they wouldn’t have snow until next weekend. Opening the window, Scott leaned out to see many of the kids running around in some freshly packed snow thanks to Bobby. The Iceman was setting a bad example, wearing nothing but jeans and a t-shirt in the below freezing temperatures. Apparently it was everyone against him and anything goes. Hannah Tibbon, a hydrokinetic, had just learned how to ‘water bend snow’ as she put it and was sending the frozen liquid at Bobby while Sofia Mantega used her ‘air bending’ to make sure the snow balls thrown by the other students hit their mark. Within seconds, Bobby was pelted with over a dozen snowballs and went down like a felled tree trunk. Scott couldn’t help but laugh, but ducked back inside when he heard his phone ringing. Snatching it up, he saw Agent Duncan was calling. In a back alley in Washington D.C., Victor Creed, more commonly known as Sabretooth, made his way down to the end. He sniffed the air trying to track a scent he had the unfortunate privilege of knowing. “Cajun,” the feral mutant growled. “You’re late,” a voice detached itself from the shadows. “No one cares,” Sabretooth sneered, not impressed with the man before him. “So you know about the Zeta Archive,” he asked. “Remy can be invisible when he needs to be,” Gambit handed the paper back. “We can start in at eleven,” the Cajun said cheerfully. “Eleven tonight?” that sounded good to Creed. “Magneto,” the replied echoed off the brick walls. “What happened here?” Scott asked as he looked around the damage done to the Bella-Agra facility. The ceiling had cracked in various places and many support beams had fallen, but, amazingly enough, the three beams that kept the whole place from collapsing in on itself were still intact. “So she’s prognostic?” JP automatically assumed. “That’s…” he trailed off as he contemplated what that meant. “Exactly,” Jean nodded at him. “I thought Wanda had left the team?” Scott turned to Fred to see if he knew any more about the situation. “And now she’s back,” Scott rubbed his chin for a moment, trying to figure out what this meant for the Acolytes. Was this a direct response to them stepping up their efforts? “That wasn’t really what I called you down here for,” Fred gestured sideways with his head and started to walk in that direction, going around a fallen support beam and back behind some shelves. “They were probably captive mutants,” Scott shook his head. He knew stuff like this went on but it never made him any less horrified when he came face to face with it. “The Acolytes killed him?” Bobby nearly squeaked. “I suppose you’re right,” Fred agreed once he thought about it. “Any clues as to who he was working for?” Scott figured Fred would have said already if he did but he asked anyway. “Mind if we talk to Mr. Doosan?” Jean asked and Scott knew she’d do a little more than just talk to him. “Will do,” Scott said to the departing figure. “Then it’s a good thing the Acolytes put him out of business,” Logan was sniffing around, trying to catch a familiar sent Scott supposed. “You mean like we do?” Bobby said wryly. “We’re doing our best,” Jean defended the team. “Our best didn’t help these guys,” Wolverine let out a growl. The Smithsonian’s National Museum of American History was buzzing with people seeing that not only was it a Saturday, but it was after a holiday when families were traveling and in serious need to do something fun. Dressed in a polo, slacks, his brown leather jacket, and a pair of sunglasses perched on his nose to hide the red-black of his eyes, Gambit pretty much blended into the crowd of tourists who dressed in everything from glorified pajamas to well-cut suits. Sabretooth on the other hand, with his long scraggly blonde hair, animalistic build, and general feral demeanor, was the opposite of inconspicuous. “What are we doing?” Sabretooth semi-snarled at a kid who was staring at him, causing the kid to hid behind his mother’s legs. “Going on a tour,” Gambit said cheerfully, slapping a brochure against Creed’s chest and getting in line to join the tour group. “Trust Remy, no?” the Cajun grinned and moved forward in the line. With much annoyance, Sabretooth waited in line among the yelling masses of families. The children’s cries pierced his ears and the smell of sweat assaulted his nose. This had better be worth it. The tour began and they started to walk through the complex, learning about various historically boring facts and information. For the life of him, Sabretooth couldn’t figure out the Cajun’s plan. And when he noticed that the guards had doubled, things just got more pointless. They were keeping their distance, but had their eyes on him as if he was going to sprout claws and proceed to tear the annoying tourists who kept bumping into him into little, tiny, pieces of jerky. To be fair it was definitely a possibility. He looked over to ask Gambit what the plan was, but the thief was gone… nowhere to be seen… and the guards were all focused on Sabretooth. Damn that Cajun pickpocket, if he was going to make him the decoy, at least he could have said something. Getting past the first stage of security was easy, a simple matter of slipping through a door that was supposed to remain locked but was propped open by someone just popping out for a cigarette, or soda, or whatever, it didn’t matter. There was always something about this time of day. Not breaking his stride, he walked through an office area which was now empty save for an individual playing Candy Crush on their computer and completely oblivious to his presence. There were no cameras in this area, only at the entrance, which he snuck under, so he walked around unimpeded, looking for an ‘important persons’ desk. As Gambit passed an unused desk chair, he slid his coat off and laid it across the back. Then two steps later he came across a chair which had a work smock dangling off it. With an easy swipe, he picked it up and whipped it around to pull it on… it was an inch too short on the sleeves and wouldn’t close. Using his newfound credentials which hung off the lapel, Gambit walked out of the office down a hallway, even passing two employees as he went. Both noticed him immediately and he smiled with just a slight upturn on his lips. They definitely noticed him, but what they didn’t notice was this badge was for a Sanjay Deengar and the photo ID looked nothing like him. And with a building so big and with so many staffers, the odds of someone being curious that they hadn’t seen him before was definitely in his favor. Both the man and woman checked out his backside after he passed. Remembering the passage from the last time he was there, Gambit found himself in a large storage area with huge, two story shelves. Crates and shrink wrapped pallets lined everywhere, the whole place very dark and dusty, though incredibly maintained. With the agility of a feline, Gambit jumped on top of one of the crates, then used his momentum to launch himself up and across the aisle, grabbing hold of the shelving unit and pulling himself up into an empty spot. A woman with long brown hair pulled up into a pony-tail, and Buddy Holly glasses perched on her nose, walked down the aisle, her attention split between the tablet in her hand and the numbers on the shelves. Gambit left her to figure out her filing problem, turning and finding himself a way to transverse the shelving unit quietly. From there he jumped across two shelves and shimmed down another, all without making a sound. This landed him several feet from a door… a door which had a five number keypad lock, hand print reader, and an infrared IR camera trained right on it. An Ace of Spades appeared in his hand. To the keen eye a faint glow of magenta traced the lines of the ink as kinetic energy followed the path of least resistance. Gambit’s particular mutation allowed him to convert potential energy into kinetic energy which had a rather spectacular end result once that energy was released. Pouring in as much energy as he deemed necessary, Gambit tossed the Ace of Spades into the air. Only inches from the lens camera, it exploded in a bright magenta boom. This confused the camera, blinding it and causing the system to ‘wig out’ as the technical term is called. The camera would correct itself soon enough, Gambit had a minute, at most. Rushing forward, the code was easy to determine from the wear pattern, it seems they hadn’t changed it since last time he was there, so that got him the first green light. The swipe of the badge he took got him the second. It was the hand scanner that would be the tricky part. Laying his hand on the glass, he quickly fed kinetic energy into the device, causing the reader to fluctuate and have difficulty reading. There was a certain level of acceptable deviation in scanners to account for the fact that people get cuts, swell up, etc, and it was all about getting the reader to land in that butter zone. Too much energy and it would either time out, or worse, explode. Too little and it would realize his print did not match. But just the right amount and it accepted that his handprint was within allowable parameters and gave him the third green light. The door popped and Gambit was inside with the door shut before the camera came back on. Now he just had to figure out where the Castor file was being stored. After having a good look around the damaged building, the team decided there wasn’t anything else for them to find. It was definitely Wanda’s work, the entire cascade being one convenient incident after another. But the workers and guards didn’t have anything to share. The sub-basement was Rowland’s business, they paid no attention. “Can do,” the speedster nodded and took the box from him before disappearing down the hallway. “Are you heading over to speak to Doosan?” Fred asked him. “That was the plan,” and one that received no arguments from the team. The good thing about the Zeta Archive is that no one was ever down there. The bad thing about the Zeta Archive is that it’s a maze of rooms and cameras. But this wasn’t a problem for the thief who had intimate knowledge of all the blind spots from his last visit. He easily made his way into a file storage room with held large black cabinets with cryptic words denoting what might possibly be inside. Checking the details on the piece of paper the kitty cat had given him, Gambit looked around between the cabinets for something that might give him a clue. He finally found a drawer that looked promising as it was labeled Origin and Dynamic of Genetic Variations. Inside the drawer was a blue archive box which he picked up and carried over to a handy table. Switching on the desk lamp, Gambit put on a pair of white gloves which he had in his back pocket. He brought them because he figured he might need them if he was dealing with old paper. Carefully opening the box, there was a bound volume from the 1960s with the name A Study of the Origin and Dynamic of Genetic Variations in the Population of Genosha Island by Liam Castor, Ph.D, University of Essex, Colchester, England. 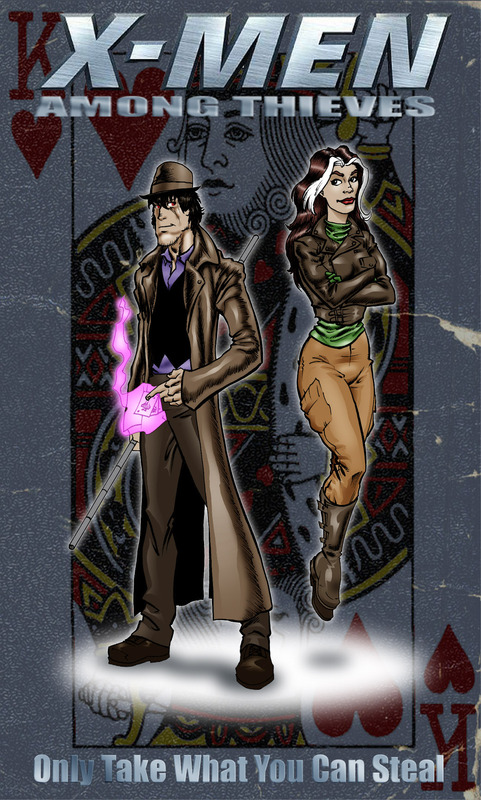 “No wonder they just call you the Castor file,” Gambit chuckled as he laid the massive volume down on the table itself. Putting his booted foot up on a chair, he pulled his slacks up to reveal his boots were rather high collared. This allowed him to conceal a rod of about three inches down the side. Snapping it at one end, it folded out into a half-circle length of six inches. Working the controls, a blue glow began to admit from the flat side which was inset with glass. Then Gambit went to work, placing his phone on the desk and opening an app which would capture the images he was taking using his portable scanner. It didn’t take very long to copy a page, but it wasn’t exactly quick either. One page down, a couple hundred left to go. Bobby’s Ford Escape was still in the shop after getting shot up, so they were in Jean’s Ford Focus when they pulled into the parking garage of the Waldorf Astoria hotel. Scott, Jean, and Bobby piled out while Logan leaned against his bike having barely beaten them there. “How you wanna do this, slim?” Logan asked him, a tint to his voice that said Logan wasn’t in the mood for niceties. “We’re just going to talk to the man,” Scott frowned at him. “Wait,” Jean stopped, putting her fingers to her temple, frowning. “Jean?” he couldn’t quite understand the look on her face. “I smell it,” Logan, as short as he was, always managed to outpace them, slipping between two of the cars. “I’m going to totally call 911,” Bobby pulled out his phone and started to make the call. “What kind of situation?” Bobby shouted at his retreating form as he started to run towards the entrance. The elevator on the fourth floor of the hotel opened up and two individuals stepped out. The first was a tall woman with jet black hair, dark purple stripes accenting her violet colored eyes. The second was an even taller bald man who looked as if he was literally built of outhouse bricks. They covered the space between the elevator and room 412 with ease, catching the attention of a guard standing outside the door. The guard raised his hand to stop them and the woman returned the favor, a sonic wave emanating from her fingers, sending him flying down the hallway to crash against the far wall. Not breaking stride, the man grabbed the handle of the door and literally ripped it off as if it was made of papier-mâché. A swift kick to the door sent it off its frame and the man walked through, taking two bullets to the chest. He looked down at the now torn holes in his shirt and it only made him angry. The woman stepped in behind him just in time to see the target get pushed into the bathroom by one of his guards while two others started in stunned silence at her partner taking a hit without even flinching. This job was going to be easy.